The United States and Canada have long been active trading partners, with annual trade totaling over $535 billion. This figure accounts for over 17 percent of all U.S. global trade, and the majority of freight transported between the two North American countries is shipped via ground carriers. Shipping freight to and from Canada can be relatively easy with the help of an experienced professional carrier. The best transport carriers for cross-border shipping have well-trained account executives to manage all client accounts, assisting customers with arrangement and handling of each freight cargo shipment and freight quote Canada. These highly efficient transport carriers also often employ customs coordinators to ensure smooth border crossings for all shipped products. These coordinators are very familiar with the customs regulations, including any recent changes in rulings or laws governing product shipments crossing the border between the U.S. and Canada. In the autumn of 2013, the Advanced Commercial Information (ACI) rulings took effect, initiating additional updates to Canadian customs regulations. Unless you work with a carrier that has a customs coordinator on staff, it is advisable to be familiar with all customs rules, amendments and additions as listed in this document. When arranging transport of product shipments from the U.S. to Canada, you can ship them by Truckload (FTL), Less Than Truckload (LTL) or railroad transport. By aligning with a logistics specialist or hiring a logistics manager to obtain shipping rates and freight quote Canada and to handle plans for your freight cargo shipments, you can focus your time and attention on other aspects of your business. • FTL Freight Transport.– If your freight cargo load is large enough to fill a Truckload capacity trailer measuring 48 or 53 linear feet, FTL trucking is the best method for shipping your goods. Your entire product shipment will travel as a single load in one truck, crossing the Canadian border as it clears customs and proceeding to its destination for delivery. Your company will pay total shipping fees for your freight and all trucking fuel costs. • LTL Freight Transport.– If your product shipment is smaller than a full truckload, you will benefit from use of LTL transport for your freight. Your product shipment will travel in a smaller, Less Than Truckload trailer along with other shipments being transported to destinations within the same lane (postal area or geographical locale) that your load is destined for. Since you will be charged shipping fees based on the size and weight of your cargo along with your share of truck fuel costs rather than for the total cost of shipping by full-size truck, LTL can be a very cost-effective cargo transport method for your company. Shipments of freight from the U.S. into Canada can be as small as one pallet, measuring 48 inches in length by 40 inches in width by 48 inches in height. Many LTL carriers offer price rates by the pallet, regardless of the cargo type and classification you are shipping. • Intermodal Rail Freight Transport.– If your logistics manager and your carrier agree that shipping by railroad is the best plan for delivering your cargo, the carrier will arrange rail shipment of your products. This type of shipping moves according to freight train time schedules, along with time required for customs clearance of your rail freight load. 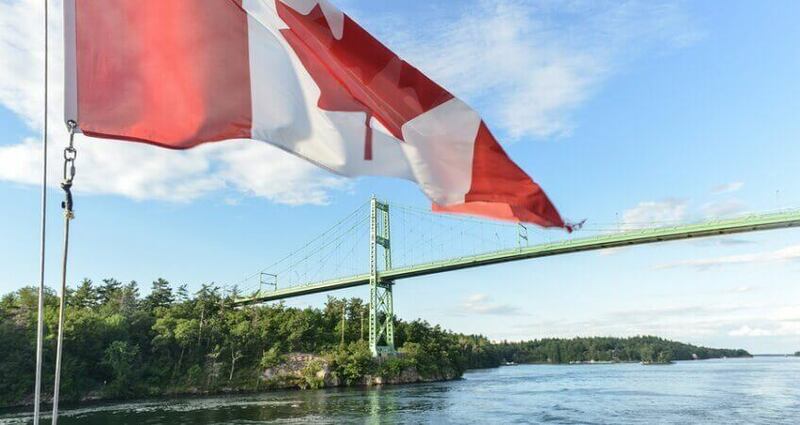 All shipments exported to Canada must have a valid Canada Customs Invoice(CCI) and a Bill of Lading (BOL). The CCI states product origin, full description and the total value of your shipment. Shippers are required to use customs broker services to facilitate cargo clearance of customs. Your customs broker will make sure that all required documentation is in order, including your CCI and BOL, for submission to Canadian customs officials. For your convenience, your freight carrier can help arrange this customs broker service for your cargo shipments, or you can contact the customs brokerage service yourself. Canadian customs regulations now require that customs officers receive all carrier and shipment-level information before your cargo’s arrival at the U.S.-Canadian border for pre-screening purposes. For this reason, it is essential that you provide your carrier with this data before your shipment is picked up for transport. This helps prevent customs and delivery delays for your freight shipments by truck or rail transport. Many carriers provide basic liability insurance for your goods while in transit, including coverage fees in their shipping charges, and you can supplement this coverage by obtaining additional insurance protection. Freight Transport Services from Canada to the U.S.
Freight transport options from Canada to the U.S. include LTL, FTL and Flatbed trucking fleets as well as a freight quote Canada. Canada continues to maintain close associations with top cargo transporters in the United States to ensure fast, accurate shipping rates and fine quality shipping service for U.S. and Canada shipping. Canadian shipping companies frequently offer special discount rates and customized freight moving services to their clients. They assure customers of competitive, updated shipping features and fees. These experienced shippers specialize in door-to-door freight transport to any worldwide location, often at discounted rates. They will arrange transport by a combination of truck and rail carriers from Canada to U.S. destinations when necessary or when less expensive than shipping by just one method. Dual-method transport can also be important for meeting some delivery time frames. For cargo shipments from Canada to the U.S., there are no weight or size limits. In addition, each shipment has single-source control. • Hot Shot Exclusive Trucks. – Cargo vans, air ride semis and dock trucks with lift gates are all grouped within this category. • Line Haul Services. – These trucks provide direct line freight hauling between all major airports in Canada and the U.S.
• Premium LTL and TL Services. – Excellent rates and delivery services to your freight load destination by quality Less Than Truckload (LTL) transport service is offered along with exclusive Truckload options to any location in the U.S. from Canada. • Padded Van Service. – Quality padded vans for mini-shipment transport of fragile or valuable items are available from Canada to all U.S. regions for the minimum fee of $2000.00. • Rail freight transport is popular throughout Canada and can be arranged to many U.S. destinations as well. If a combination of truck and rail shipping is best for your freight transport order for U.S. and Canada shipping, this dual-transport service can be arranged easily by your logistics expert or carrier company. Especially if your cargo shipment must travel over lengthy distances in Canada before crossing the border into the U.S., rail transport to the border will most likely be the most cost-effective choice. Customs procedures for freight shipments entering the United States from Canada are basically the same as requirements for freight traveling to Canada from the U.S. You will also need the services of a customs broker for moving your cargo through customs on its way to delivery in the U.S. as well as your Bill of Lading and Commercial Canadian Customs Invoice.